We positioned our ranged and healers on the raised ledge that exists in all but the very middle on each side of the room around the water. This places the majority of the raid directly behind the inactive constructs but about 1 yard off the floor and roughly 1/2 way down from the large pools. We did this for 2 reasons. This ledge has a sharp edge on the side facing the center of the room and a gradual slope on the side facing the pool behind the raid. We noticed that when constructs become molten, then seem to reset aggro (haven't tested it, possible it's just healer aggro on targets not being actively tanked). Constructs cannot path directly to a ranged dps or healer who is standing on the raised ledge. This works to our advantage. That leads to the 2nd reason. This forces the constructs to run up the only way they can reach the ledge, through the water as they attempt to come up the gradual slope on the back side of the ledge. The end result is the constructs becoming molten, aggroing onto healers since we root them in scorch, and making themselves brittle. 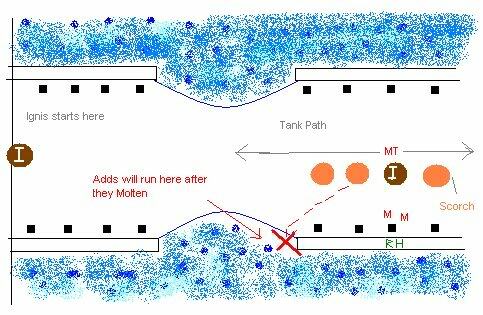 Additionally, if they are 1/2 way across the ledge they will be out of range from the AOE caused both by them being molten and then when they are shattered. This strat allows healers and ranged to be fully in LOS of all melee and tanks at all times. It should be noted that Ignis doesn't fall prey to the need to path around the ledge due to his height so it allows him to grab players without having to cause a massive positioning issue. In the end we tank him with his back to the ledge (any of the 4 ledges will do). We have melee stand just in front of the ledge. Tank him with his back facing melee and ranged, and then line up scorches from left to right and then back again as they fade. We only have to assign 1 person to kite them into the scorches, 2 people to snare them inside, and no one has to worry about them once they become molten since healer aggro takes care of their pathing straight into the water. A single ranged dps doesn't even have to move as they are in LOS from the point where they become brittle as they shatter them. I hope this helps and hopefully you won't have to re-shoot your video when you see how trivial this makes the encounter. Great job as always. Ranged and healers never have to move with this setup. You only need to leave room for melee to get behind the boss. I'd guess I was able to tank him with about 2-3 yards between him and the ledge. Just in front of the dormant golem line. I only tanked him there to give myself the option of going in front or behind the scorches without getting out of range from heals as I continued laying them in a straight, unbroken line from left to right. All the OT has to do is get them to run through the scorch. They can be stunned and rooted so the OT doesn't have to stand in the scorch at all. Just as long as they are lead through to be rooted in it. Once they become molten, the ledge forces them to path through the larger, shallow portion of the pool as they attempt to get to the ranged/healers. It completely eliminated the OT or melee taking AOE dmg if they sidestep the molten golems as they come in from the far right. Otherwise they don't have to worry about it at all. so following failure (mostly mine) at this last night, i decided to read up on this fight and found this post here. one problem i have with this setup is that the constructs are going to run for the healers immediately upon spawning, which means they are sidestepping the scorched earth that turns them molten. that is, unless the OT (in last night's case, me) can pick them up pretty much immediately. which is sorta hard to do with the giant sight obstruction in the way (ignis), the fact that they can come from any spot in that massive room, and the general chaos of a raid-sized fight. one, the scorched earth is always next to a pool, rather than being a significant distance away such as when he is kited along the far side of the wall. two, and what would help the OT mostly, is that the constructs are always going to run to the same place: the center of the room. they are easily seen, easily picked up, easily kited to whichever corner of the kiting square the scorched earth is at. the main problem with setting the healers on the wall is that if the constructs make it up there, it takes a significant amount of time to get them back and kite them around that wall to the scorched earth again, and you only have 40 seconds between adds. essentially, if a construct add is not immediately seen and picked up before it can make it behind the wall, it is a wipe. three: the healers are never out of range of anyone in the raid. i should note that it is correct that constructs reset aggro when they turn molten. and this is obviously where the convenience for the OT of getting them molten in the first place becomes a difficulty for the rest of the raid of getting it into the water and downing it. it takes 10 full seconds of a construct being in the scorched earth to melt. it also takes some time to spot the add, pick up aggro, kite it into the burned circle, and hopefully the circle doesn't move/disappear. anyway, the OT needs to be ready for the next add before it goes off on the poor healers. so, there really should be a 2-person DPS team (in case someone ends up in the pot) for picking up the molten construct's aggro and kiting it into the water, then whacking it for 5000.
i wanna try this again now that i've read up on it more. thoughts? side question, does fire-resistance aura reduce any of the damage in this fight? also, i made a macro that targets construct and taunts. which will be absurdly helpful i think in either tactic.